For many people that work in and around the city, there are time restrictions when it comes to lunch breaks, and that can often mean grabbing something unhealthy to eat. 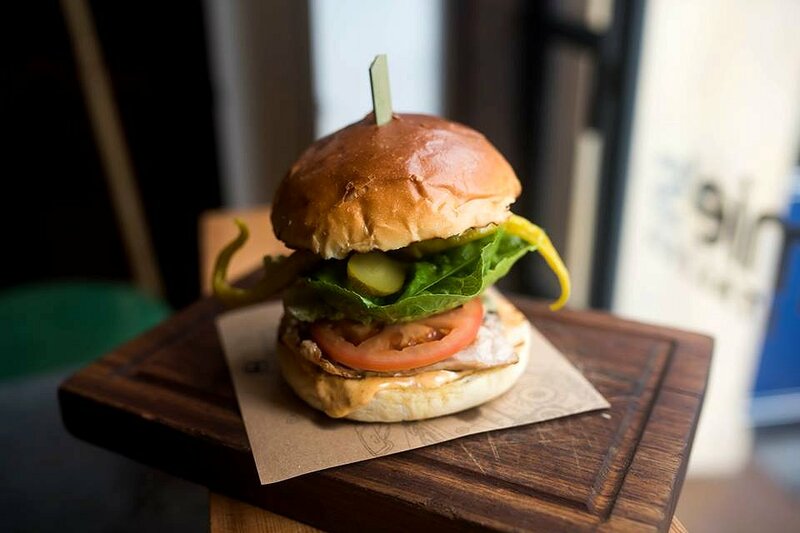 With Jamie’s Italian, that doesn’t have to be the case, as they’ve just launched their new Super Lunch Menu. 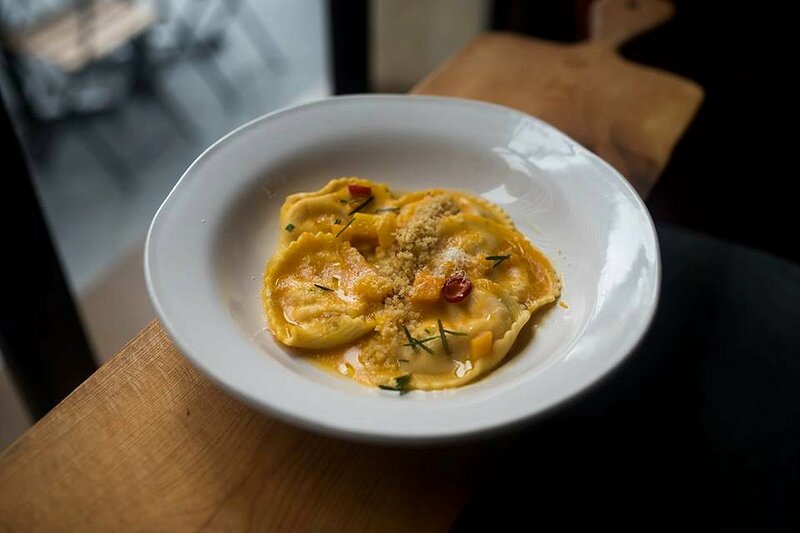 Designed for people on the go, Jamie’s Italian offers delicious modern Italian food right at your finger tips. 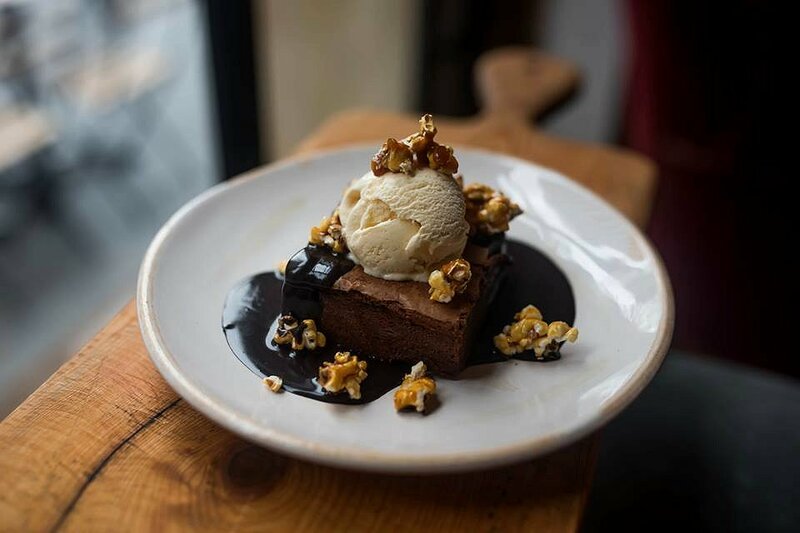 Whether you’re rushing back to the office, catching up with friends or family, or just refuelling after a shopping spree, Jamie’s Italian has you covered. Affordably priced, two courses start at $25, while three will set you back $30. 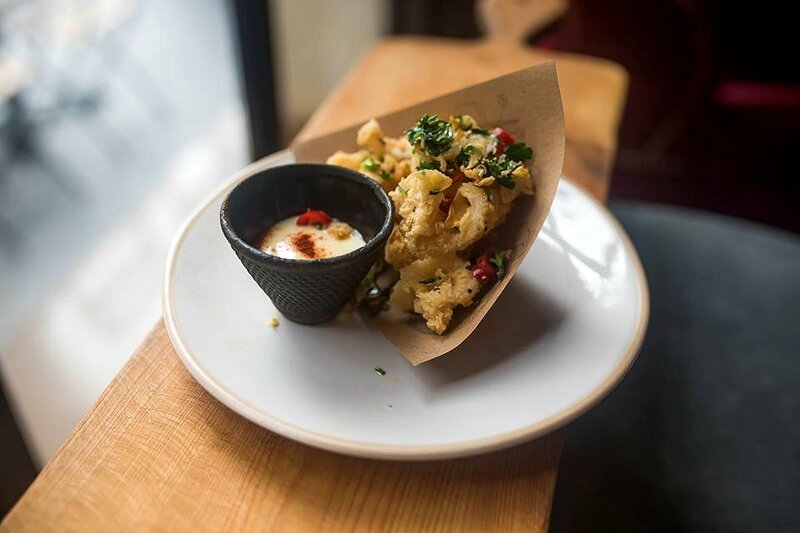 For starters we had the Crispy Squid with garlic and lemon mayo, chilli, parsley and fried garlic. The squid was fried to a light golden brown and had a lovely crispy coating. The squid itself was soft and delicate, and the taste of garlic was prominent. The acidity from the mayo and the heat from the chilli provided good balance to the dish. 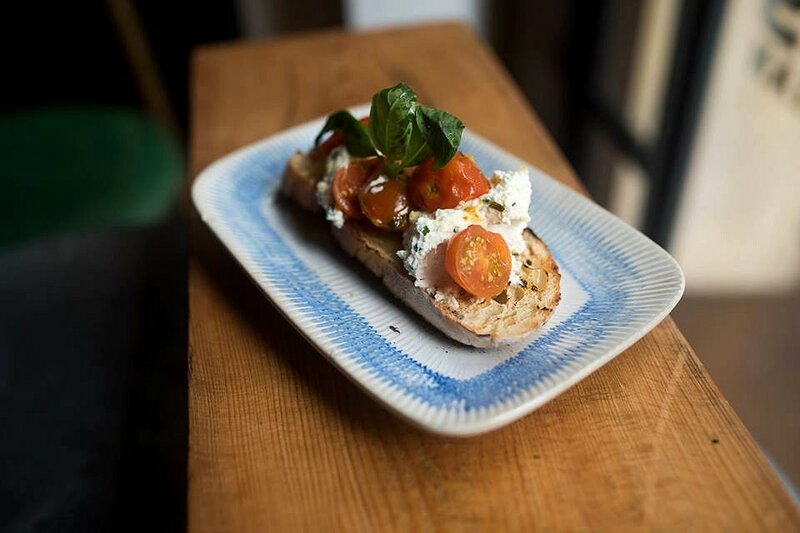 The Tomato and Ricotta Bruschetta was topped with slow roasted cherry tomatoes, whipped artisan ricotta, basil and extra virgin olive oil. The cherry tomatoes had a lovely natural sweetness which was balanced by the aromatic, peppery basil. The ricotta was soft and delicate, and worked well in combining all the elements on the crunchy grilled bread. The Porcini Arancini was made from a mushroom risotto and had three types of cheeses. 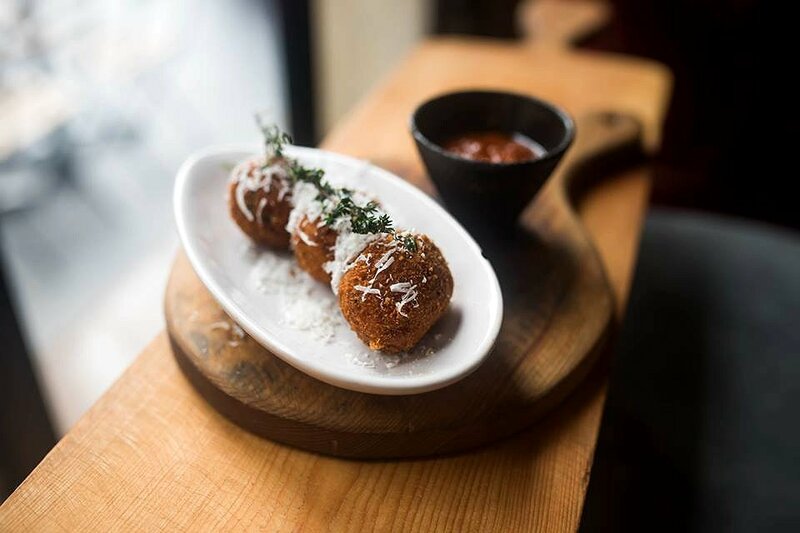 The arancini balls had a crunchy exterior and were fried to a dark golden brown. The filling was soft and moist, and the mushroom flavour in the risotto was prominent. The provided dipping sauce started off sweet and then had a nice kick to it. 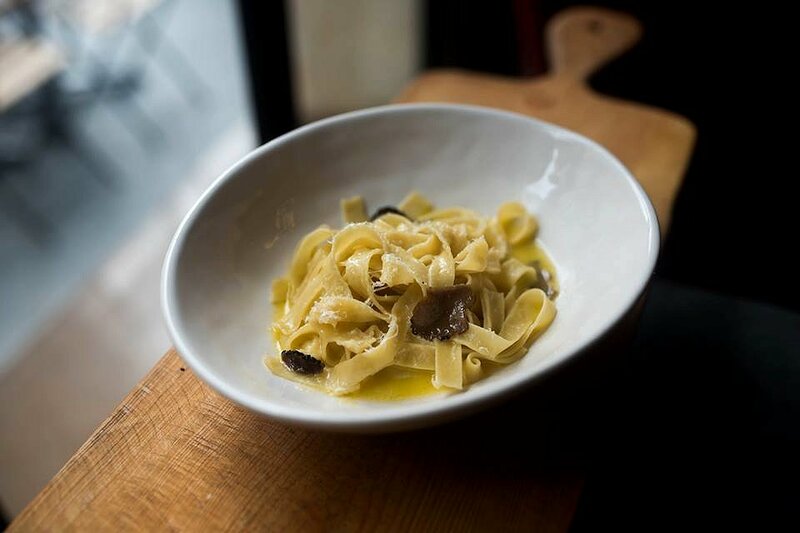 Anything with truffle in it is delicious, and the Truffle Tagliatelle was no different. The long ribbons of handmade pasta were al dente and were soaked in a silky black truffle butter. The aged Parmesan added a hint of sharpness while the extra shaved black truffle only made the dish more luxurious. To start off the mains, we had the Pumpkin Ravioli. The pasta was cooked to perfection, and each piece of ravioli was a decent size. The squash and ricotta filling had a lovely natural sweetness which matched well with the pumpkin sauce. The crumbly texture of the amaretti added contrast to the other elements of the dish. 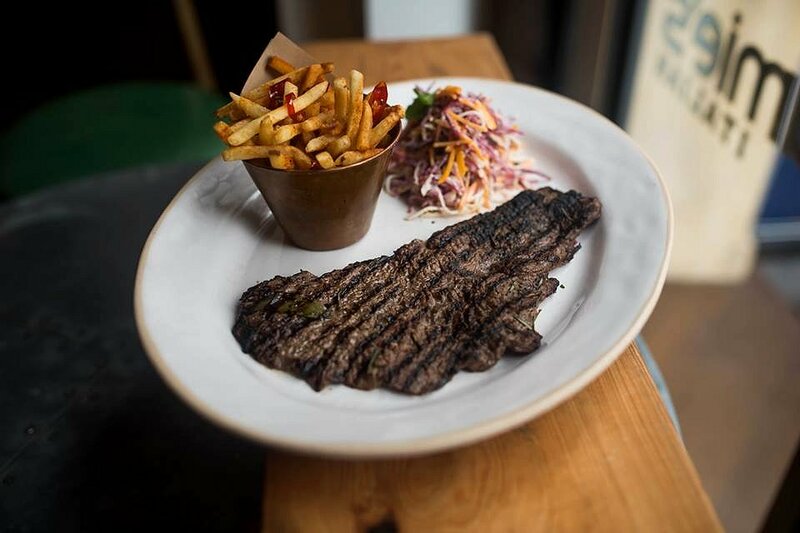 The Italian Steak and Fries is made up of a flash grilled, grain fed rump steak, Italian spiced skinny fries and a rainbow slaw. The steak was thinner than what I usually have, but easier to cut apart. The meat was well seasoned, and the combination of rosemary and the chargrilled flavours were a real treat. The chips were nice and crunchy, as was the slaw, both of which combined well with the delicious steak. One of the healthiest options available is the Super Food Salad. 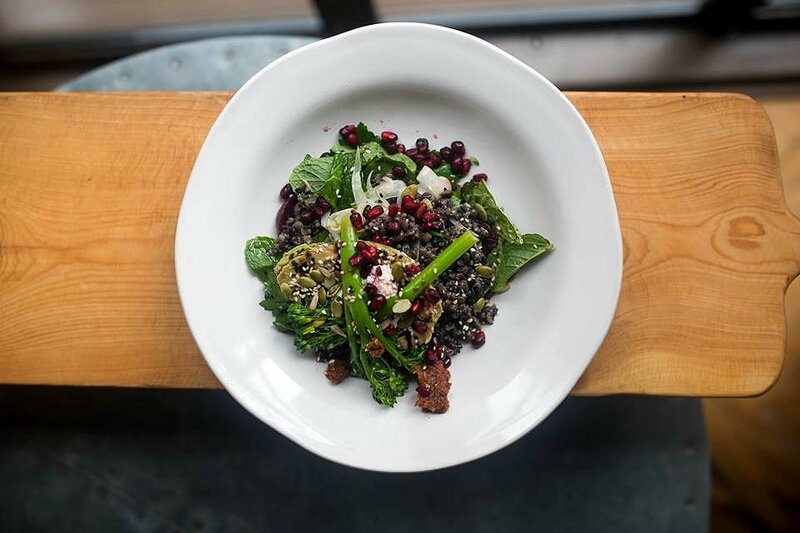 Consisting of grilled avocado, roasted beets, pulses and grains, broccolini, kale, pomegranate and toasted seeds, harissa dressing and artisan ricotta, you’ll never find a more healthier combination of ingredients on one plate. The contrast in flavours and textures in this dish was amazing. The avocado was soft and delicate, the grains and seeds added a nice crunchy texture, and you had the sweetness from the beetroot and pomegranate. If there was one criticism, I thought they could have added more of the delicious sundried tomato paste. The Gennaro’s Chicken Club is a chicken burger with mortadella, spicy nduja mayo, fontal cheese, tomato and rocket. The chicken is a thigh fillet that has been marinated and then chargrilled. It was juicy and succulent, with lovely smokey flavours. The tomato and rocket were fresh and crisp, while the heat of the chilli was complemented with the spicy mayo. The sourness of the pickles added a good contrast in flavour, and the soft seeded bun was nice and firm, holding all the ingredients together. 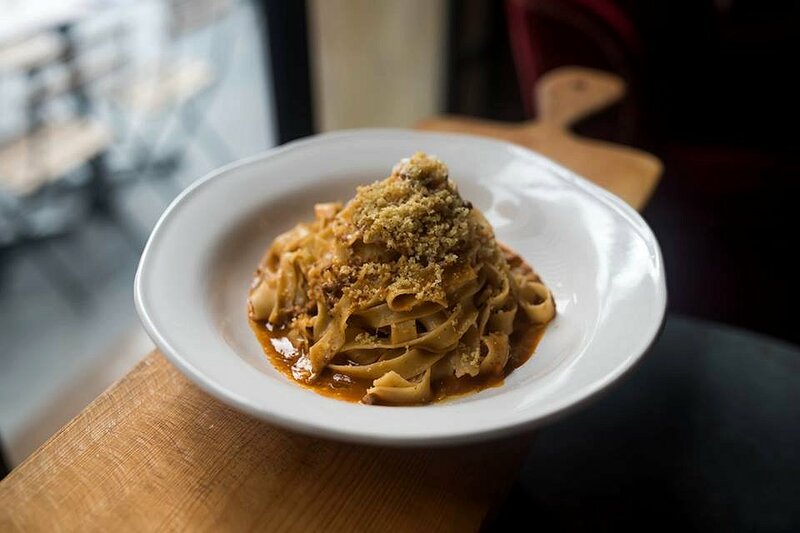 The Tagliatelle Bolognese follows Gennaro’s original pork and beef bolognese recipe. The pasta sauce is slow cooked till the mince is soft and delicate. The sauce had a lovely rich, tomato flavour, that was evenly distributed over the perfectly cooked ribbons of pasta. The herby breadcrumbs added more depth, as did the sharpness of the Parmesan. As I always say, no meal is complete without dessert. 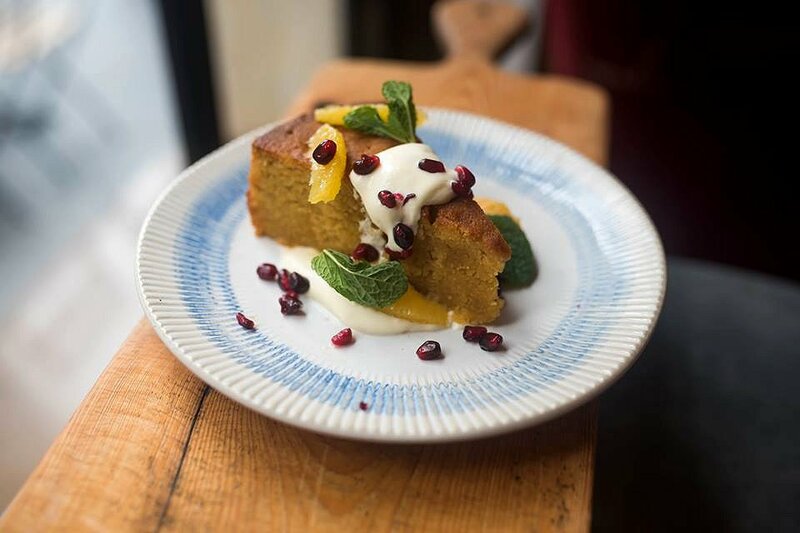 First up was the Orange Blossom Polenta Cake which is served with creme fraiche, fresh orange and pomegranate. The cake was soft and spongy with a subtle sweetness that allowed you to eat more. This was well balanced by the natural sweetness of the orange and pomegranate. The Epic Brownie is the best brownie I’ve ever had! The brownie had a slightly chewy exterior and revealed a warm, fudgy, decadent, chocolatey centre. The contrast between hot and cold with the vanilla ice cream works perfectly as does the complementing sweetness. The caramelised amaretti popcorn makes the dessert visually appealing and adds a crunchy texture. The new Super Lunch Menu has been specifically designed to have minimum preparation time. This is perfect for those who want a quality meal but have little time to spare. Each dish that we had was beautiful and rustic, with only fresh, locally sourced, seasonal ingredients used. Set in an old bank building, the surroundings were elegant with an old world charm. The service was exceptional with food arriving sooner than expected and plates cleared as each course was finished. Jamie’s Italian Super Lunch Menu is available at all of their Australian locations (Sydney, Perth, Adelaide, Canberra and Brisbane). The Super Lunch Menu is available from Monday to Friday from 12-5pm.